Kilkenny Castle (Irish: Caisleán Chill Chainnigh) is a castle in Kilkenny, Ireland built in 1195 by William Marshal, 1st Earl of Pembroke to control a fording-point of the River Nore and the junction of several routeways. It was a symbol of Norman occupation and in its original thirteenth-century condition it would have formed an important element of the defences of the town with four large circular corner towers and a massive ditch, part of which can still be seen today on the Parade. 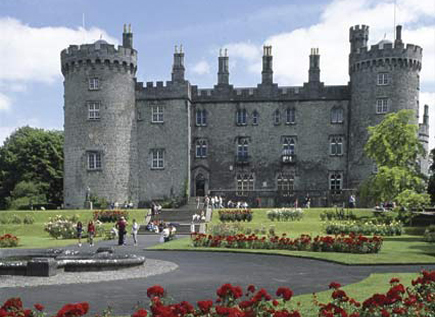 The property was transferred to the people of Kilkenny in 1967 for £50, and the castle and grounds are now managed by the Office of Public Works. The gardens and parkland adjoining the castle are open to the public. The Parade Tower is a conference venue. Awards and conferring ceremonies of the graduates of “Kilkenny Campus” of National University of Ireland, Maynooth have been held there since 2002.